Join a Typewriter Parade at the A+D FILM SERIES screening of CALIFORNIA TYPEWRITER on January 23rd, 2019 at Contois Auditorium in Burlington, VT.
Have one? Have many? We’re bringing together typing machines of all eras to share with the community, in celebration of the manual world. To participate, please contact us at ADfilmseries@gmail.com by Friday January 11, 2019 so we know you’re coming. Then bring your typewriter(s) to Contois Auditorium by 5:45pm on Wednesday January 23, 2019 with information – the make, model, year and any relevant and/or important history or story you’d like to share. Please join us for the 19th Annual Roland Batten Memorial Lecture Wednesday, October 24th at 5:30 pm for this annual talk given by Author and Artist David Macauley. The Roland Batten Lecture series was created in memory of our friend and colleague, Architect Roland Batten, who passed away in 1999. This event is sponsored by the Roland Batten Memorial Fund, TruexCullins Architecture + Interior Design, and the University of Vermont’s Department of Art and Art History. 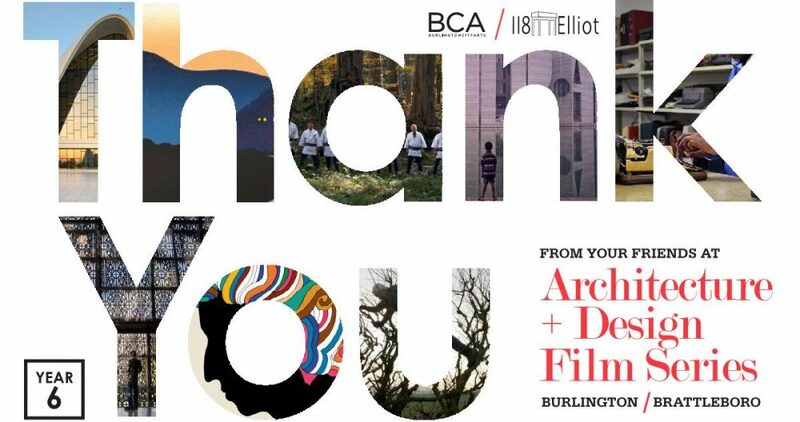 Thanks to all of our sponsors, collaborators, and attendees for your continued support of Season 5 of the Architecture and Design Film Series. Your energy and commitment is instrumental in bringing life to this fun and engaging community event! We welcome any suggestions you may have as we plan Season 6 this summer and look forward to seeing you at the first film this September. Thank you to Seven Days and Amy Lilly for their continued support of the Architecture and Design Film Series. Check it out in this weeks paper (9/20) or click the image below to link to the full article. Thanks to all of our sponsors, collaborators, and attendees for your continued support of Season 4 of the Architecture and Design Film Series. Your energy and commitment is instrumental in bringing life to this fun and engaging community event! We welcome any suggestions you may have as we plan Season 5 this summer and look forward to seeing you at the first film this September. Join us for tomorrow’s screening of Spinning Plates with an introduction by The Good Food Truck, a program of the Chittenden Emergency Food Shelf. Their goal is to provide good, healthy meals to food-insecure Vermonters who aren’t currently getting the help they need. Reception starts at 6:00 pm, introduction and screening beginning at 6:30 pm. Free pizza from American Flatbread and cash bar by Radio Bean. Located at Contois Auditorium in Burlington City Hall.